cool! I love your addition of little mushrooms too. I don’t suppose you could throw a moldy bit of wood in there and actually get real live mushrooms? How sweet would that be? Very nice! We’ll check in on the once in while you know…:) Glad you have most of your issues worked out. I was wondering what was happening yesterday! very cool. i had noticed this pictures in your flickr set so i was wondering what you were up to. This looks so much like a science project we did in 5th grade, but these are much nicer-looking. Cool!! I need to make these with the short one. Server change. ugh. I’ve been contemplating it, now you’re making me think i’m crazy for even thinking about it. These are so great! Just what I need… more projects! I hope everything is working right now. How yucky for you. Those are so cute. I love the little sheep and mushroomies. Cute! Those are beautiful! I’m going to go on a mad hunt around my place now to find some containers. I love them. I just got a new container that would be perfect. I am going to send my sister a link to come look at your pics. My nephews dog died of old age, then Dorothy the fish, then hermie the hermit crab and now he wants a bird. Maybe a terrarium will do! He really wants a dog, mind you, but his mother hasn’t gotten over the loss of their first dog, so she won’t commit. And she is definitely not buying a bird because they live as long as a dog (parakeet, not parrot). So I am thinking Terrarium! Oh my, anything that brings tiny, cheerful toadstools inside is bound to lift your spirits! Very cool! I’d love to do a couple of these. I wonder if they’d survive here in the Vegas desert? I love the little moss terrarium. 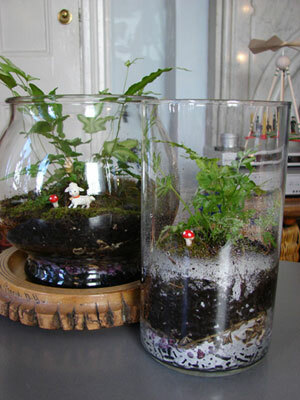 I just posted pictures of some orchid terrariums made out of cookie jars. I found yours on a google image search. 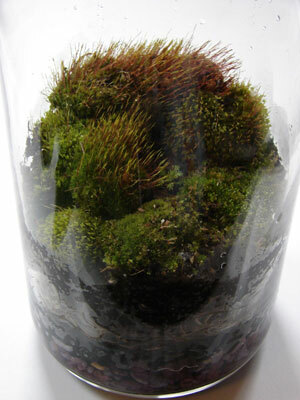 I may just have to try a moss one soon…. Very nice :) are the toadstools real? Does the carbon ever have to be changed? Anybody know a good moss ID book?